is a design that emphasizes simple horizontal and vertical lines, uniformly spaced and flat panels that accentuate the grain of the wood. 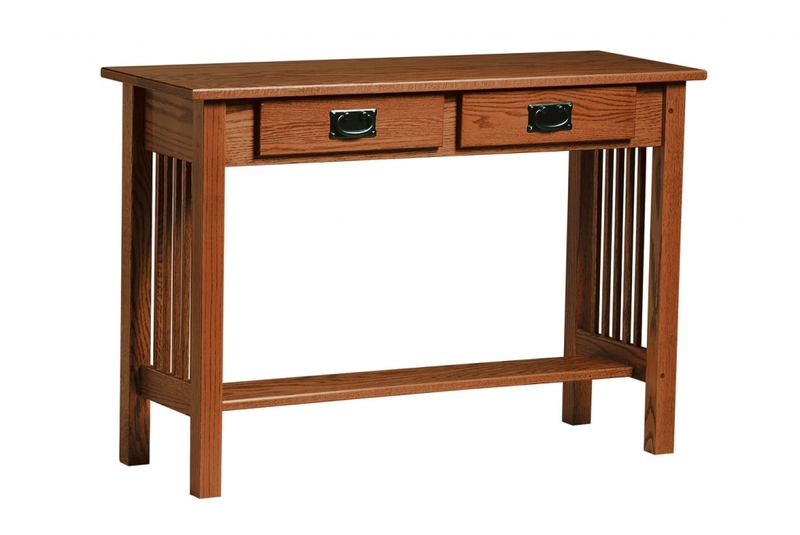 Few lines, beautiful wood and expert craftsmanship are signatures of Mission furniture. 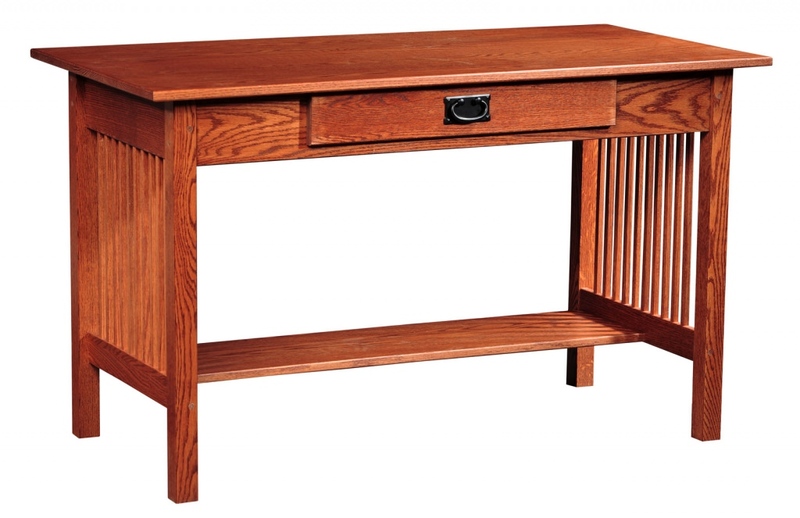 High Investment Value: Mission style furniture is built to last for many generations. It’s time-tested appeal to collectors goes back to early 1900. Unique Design: Mission furniture is not mass-produced on industrial machinery. It is inspired by the arts and crafts movement in the 19th century and is hand-crafted. It is designed to be very functional. 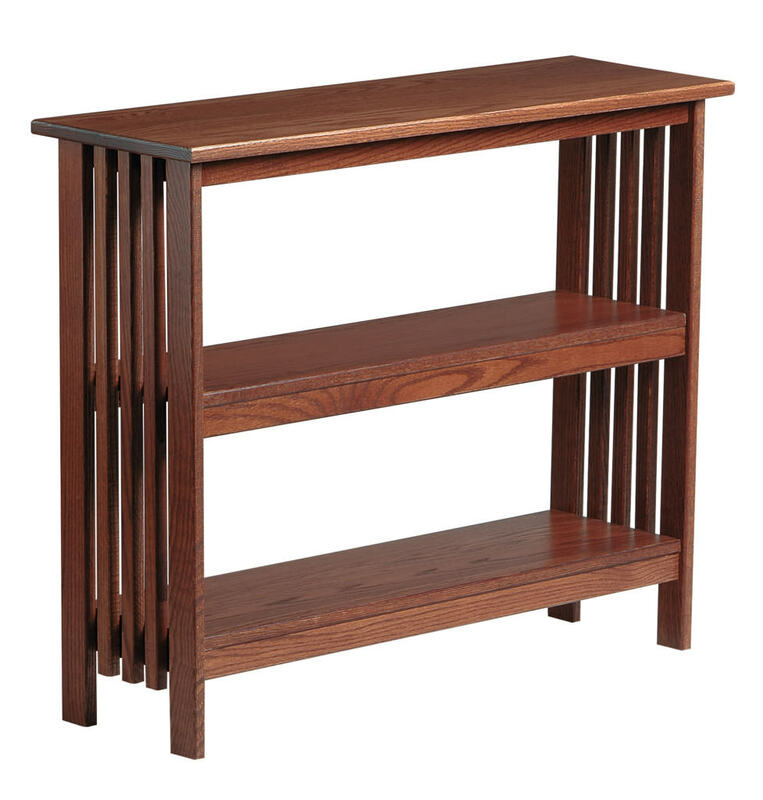 Simple and Clean Lines: Mission furniture boasts pleasantly simple framed design and few lines. Mission style has distinguished pedigree yet is uniquely modern. It “plays well with others”: It blends nicely with collectibles, muti-patterns, complementing other traditional and contemporary furniture. Natural Materials: Mission style furniture is made of unpretentious materials such as sturdy natural woods like oak (most commonly used), maple and cherry. Easy to Customize: Customers today take great pride in creating their own style for their home whether its one room or several rooms. 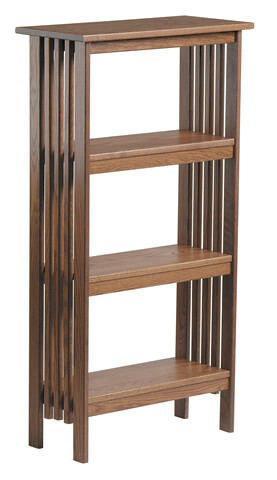 Mission Furniture is available in many stain colors that allow to bring out the beauty of the wood grain. Most popular are harvest, provincial, and golden oak. Variety of choice make it easy to design your own. 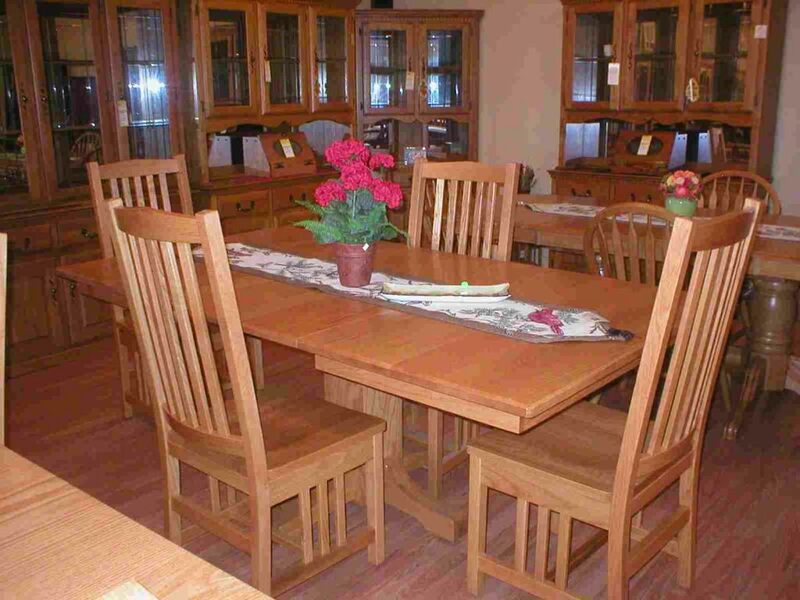 Made in the U.S.A.: Mission style furniture that we sell is handcrafted from wood sustainably-harvested in the heart of Pennsylvania Dutch country, U.S.A.
when it comes to buying solid wood furniture can be a challenge. 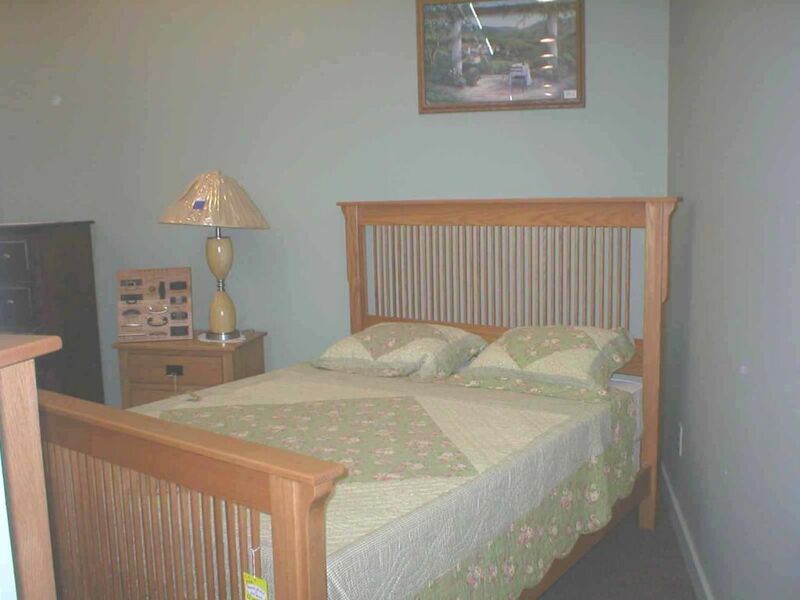 Here at the Amish Outlet our staff can guide you with your selection of perfect furniture for you. 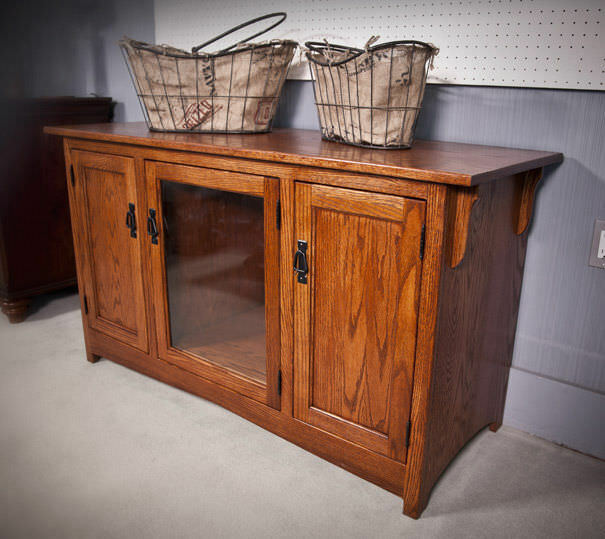 Let us teach you how to take proper care of solid wood furniture. Ask us about the best products to keep your wood well-conditioned so that your wooden furniture will keep delighting you and yours for generations to come! Do dining tables have self-storing leaves? Do the drawers come with Full-extension drawer glides? Full extension drawer slides allow for complete access to the entire drawer for more usable space. That is why all bedroom, dining, and occasional pieces in Mission Style furniture come with full-extension drawer gliders. 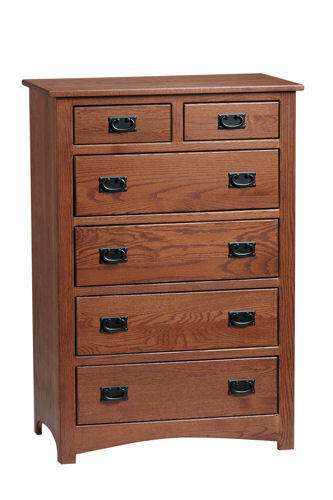 Are cabinet and dresser drawers made with dovetailed? All Mission China cabinets, dressers, and occasional pieces are dovetailed which adds strength and beauty to the design. Do china cabinets have lighting? All china hutches hinge-touch lighting with long -lasting LED lights. Why do tables have slates? 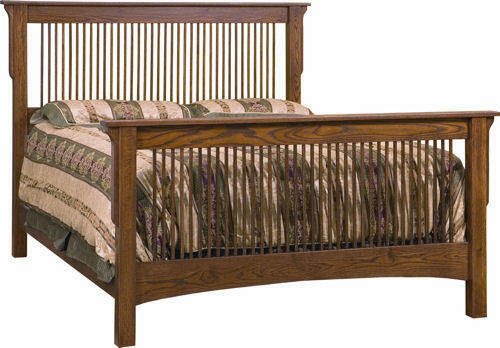 Mission furniture is built with the classic mortis-style lathes for added strength. 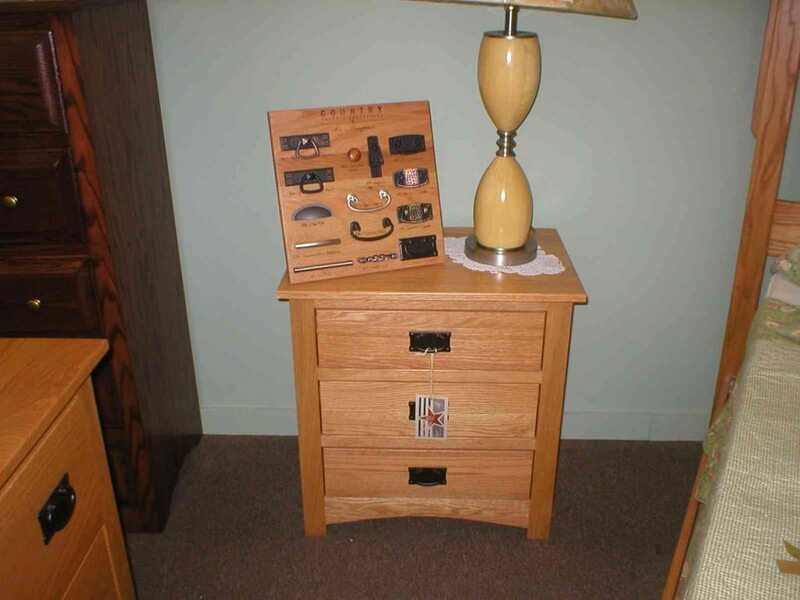 All bedroom, dining, and occasional pieces come with full-extension drawer gliders. Our furniture collections continue to grow and now include selections of Mission, Shaker, Contemporary and Modern styles. 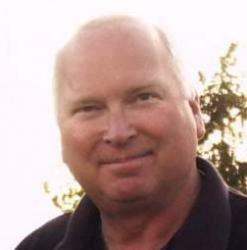 Please hover over an image to read the description, click any image to enlarge. 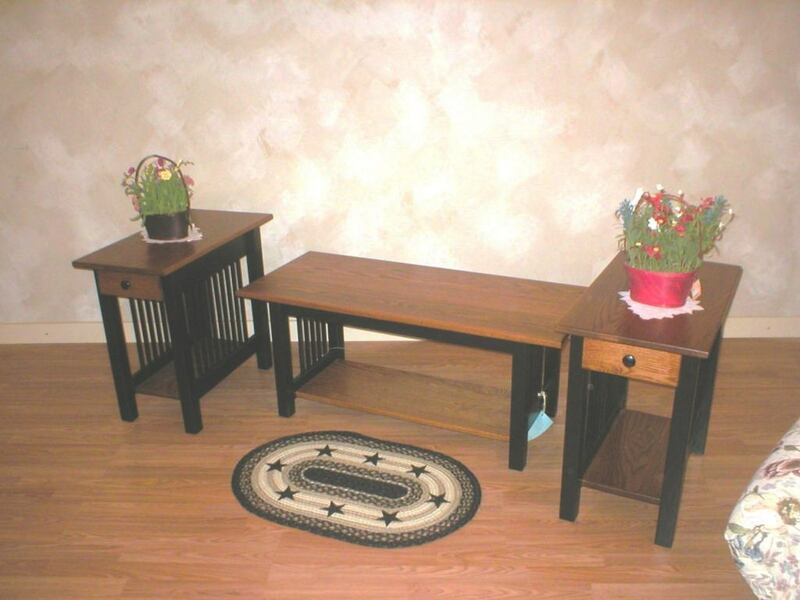 Amish made mission large extension table with a double pedestal. This table is from our transitional dining collection. Shown with the mission classic chairs. Other styles chairs are available Madison,Mission and many more. This table can be ordered in a stain color,painted or two-tone. 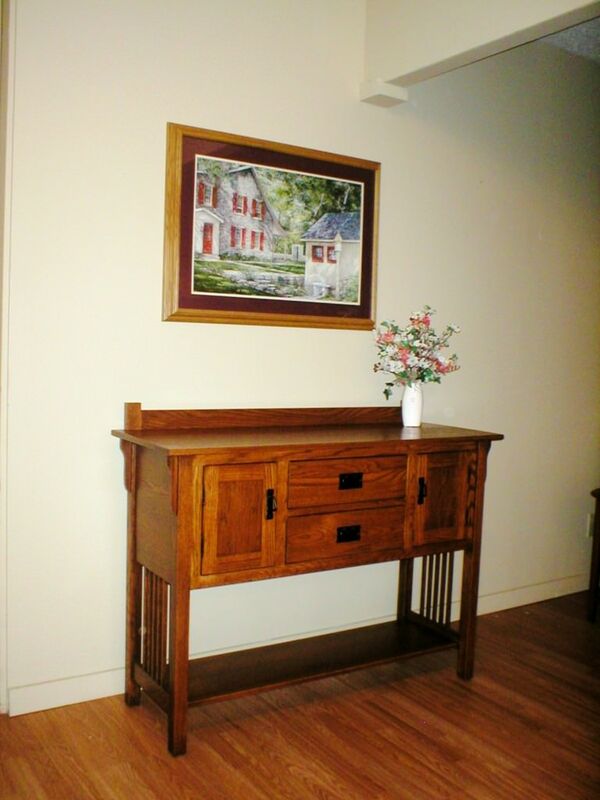 Amish Furniture - Mission Library Desk with 1 Drawer. 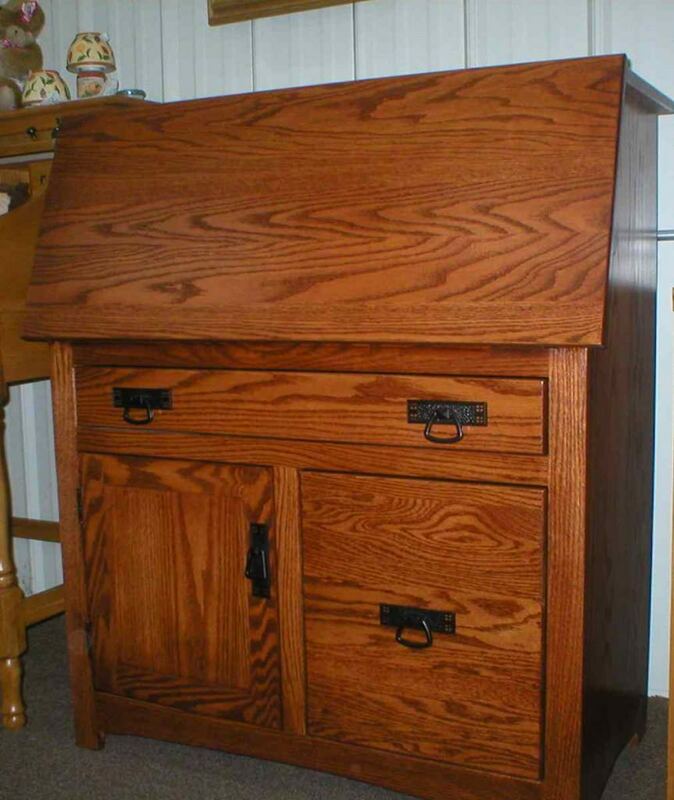 Amish made mission library desk with keyboard drawer.This desk can be ordered in oak,maple or cherry wood. Many stain colors and two-tone is now available. 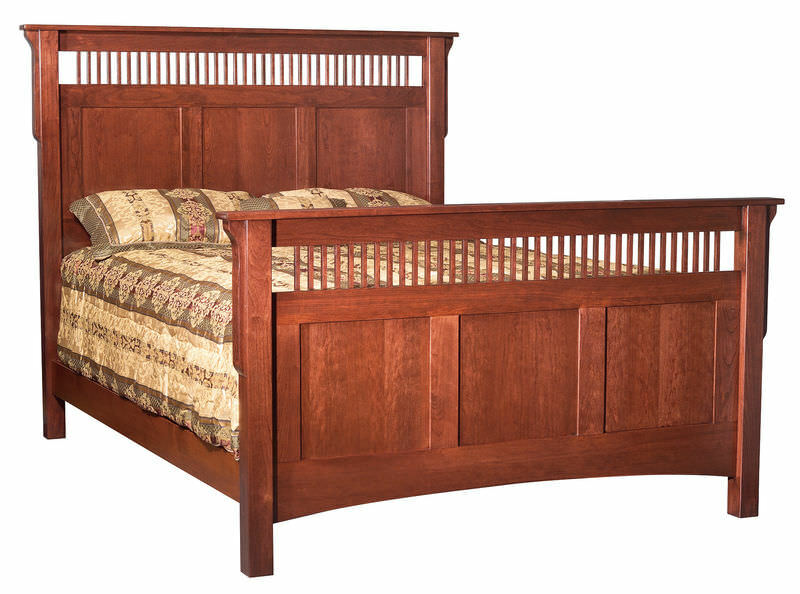 Deluxe mission queen bed in cherry wood. Mission mule chest in cherry with optional mirror. 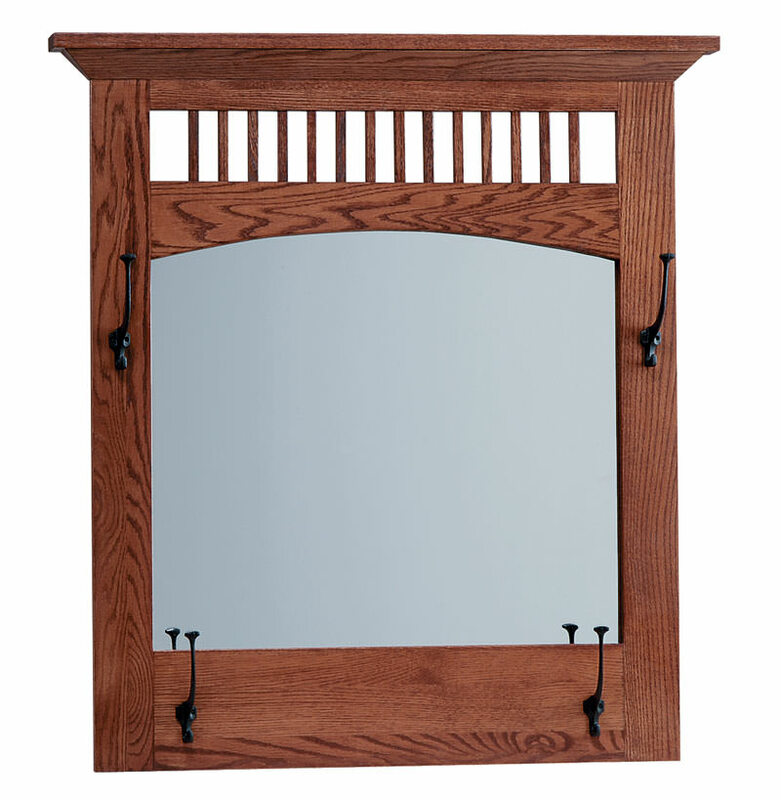 Mirror can be hung on wall or attached to dresser. Weathered nickel cup pull on all drawers. 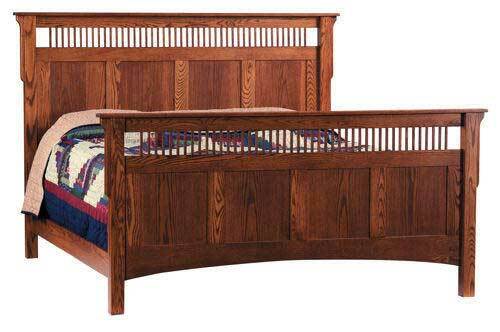 Mission deluxe bed Amish made shown in solid oak. Cherry and brown maple available. Other stain colors available. 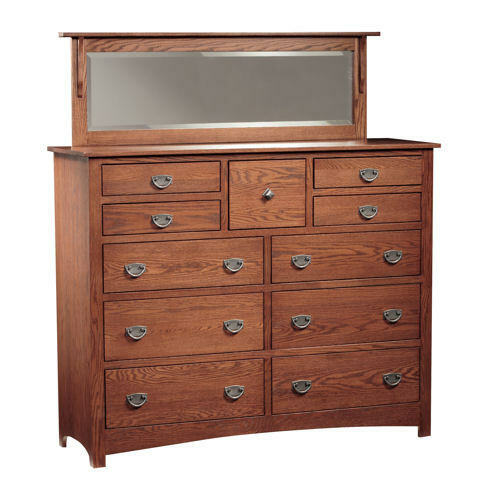 Mission mule chest with mirror. This mirror can be hang separately. Ordering options are different solid woods, brown maple,oak and cherry. Also available are different stain colors and hardware. 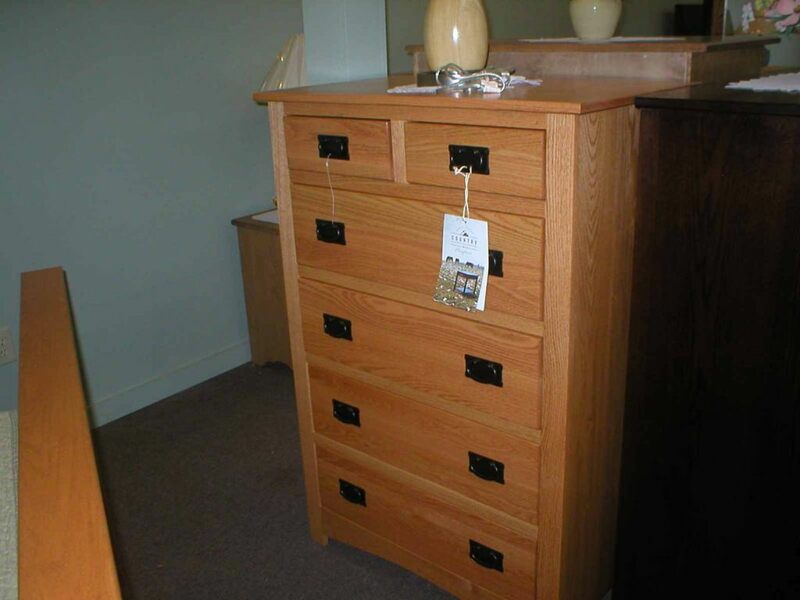 Mission chest of drawers in oak solid wood with dovetailed drawers and full extension glides. 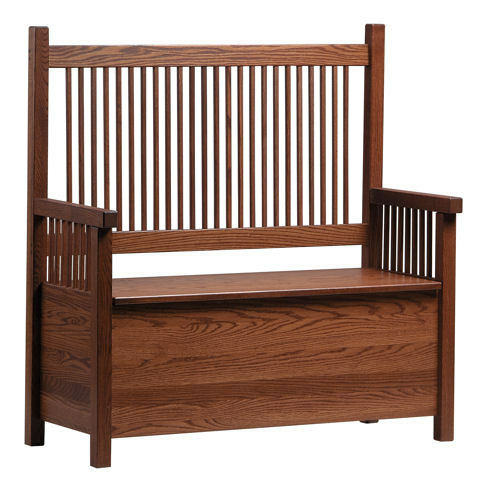 Mission deacons bench comes with solid wooden seat or can be order with leather seat. Wooden seat opens for storage. 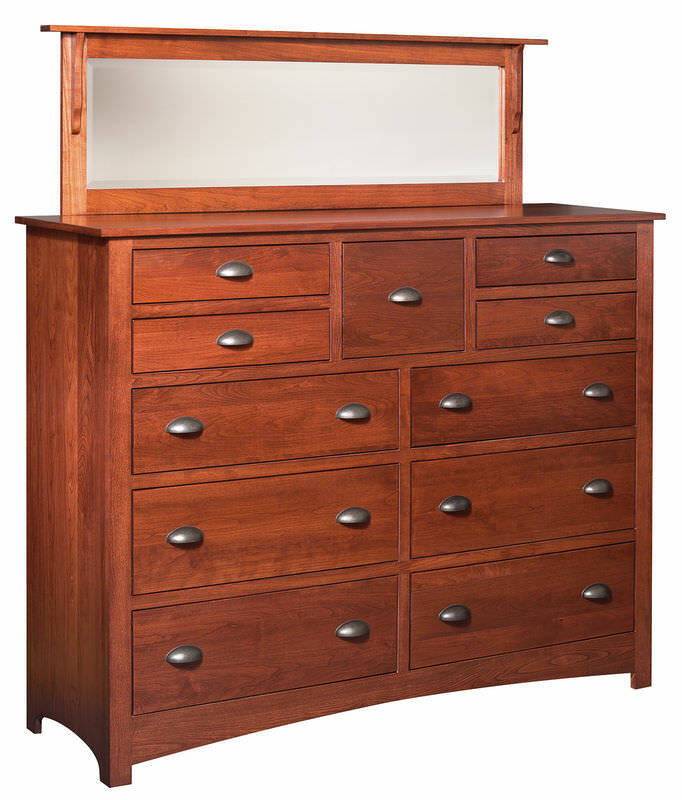 Mission oak bedroom set. 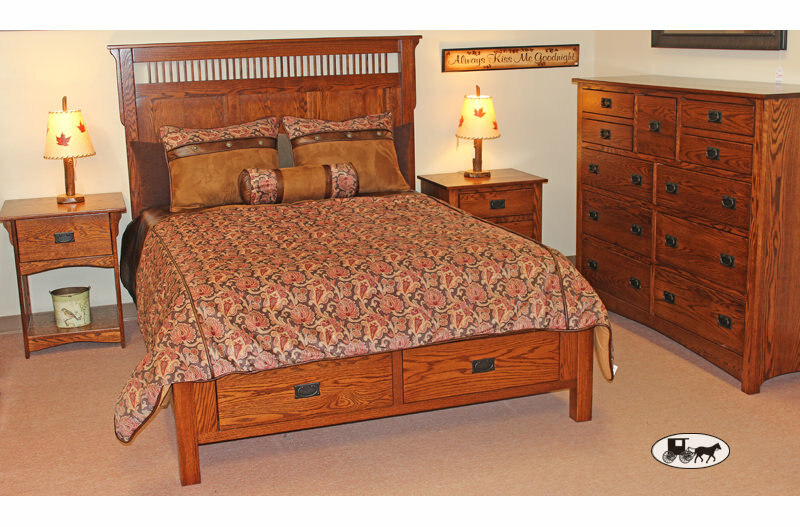 Deluxe mission bed shown with 2-drawer captains footboard. Shown in harvest stained solid wood. 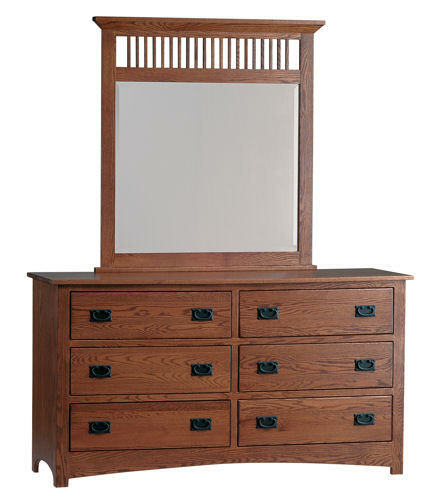 Mission 63" dresser with beveled mirror in solid wood oak. Mission style hardware. Drawers have full extension glides. 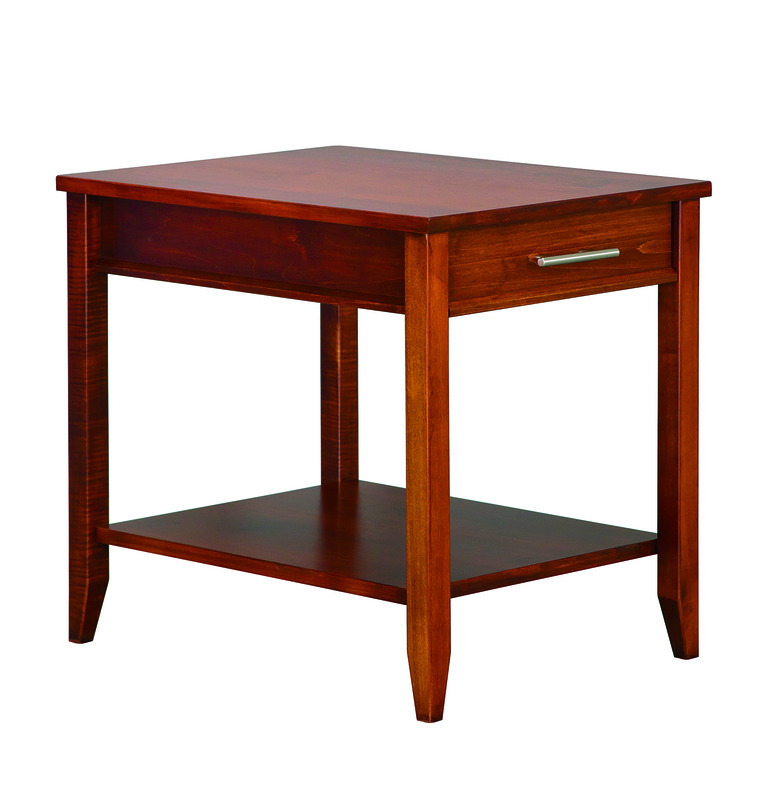 Mission magazine table with solid wood in provincial finish. Bottom rack can be used for magazine storage or any other items. 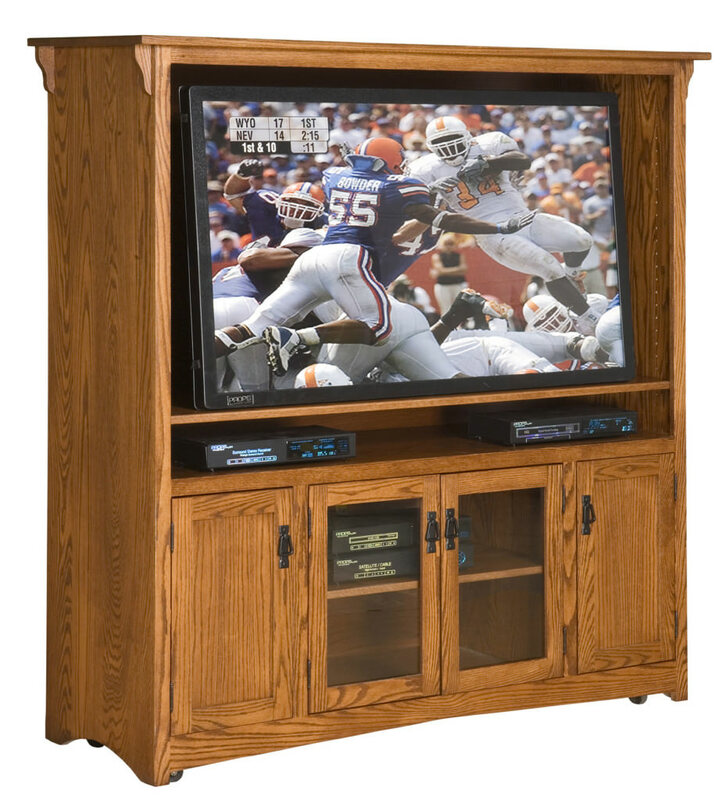 Mission entertainment center comes with two adjustable center shelves. Two adjustable shelves on either side of unit. Glass center doors for easy use of remote. This unit comes with wheels. 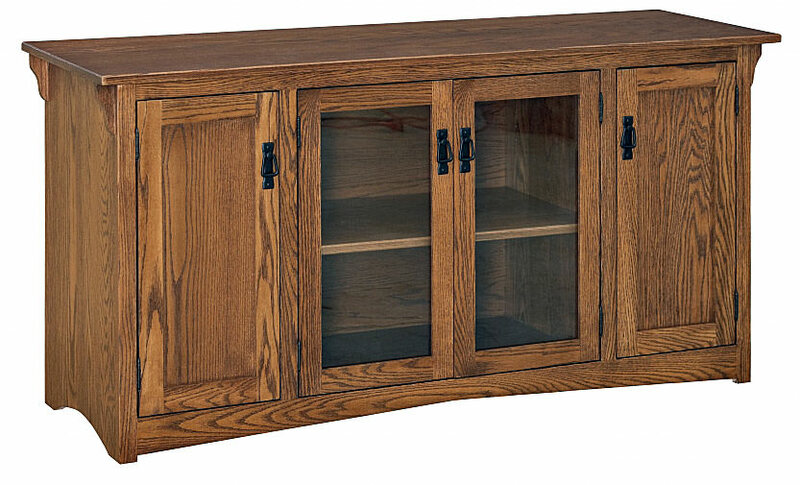 Mission TV Entertainment Cabinet. Hand crafted by the Amish. Different sizes and stain colors available. Amish made mission large secretary desk. File cabinet drawer, side door cabinet has one adjustable shelf.Top folds down for writing. Amish mission end table. Shown in maple wood. Provincial finish with weathered nickel cup pulls. 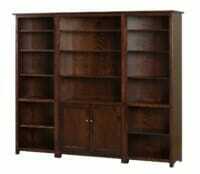 Amish made mission 2' book shelf. Mission book shelves come in 2' or 3'. 48" high or 30" with or without backs. Amish made mission side board. Full extension glides on drawers. 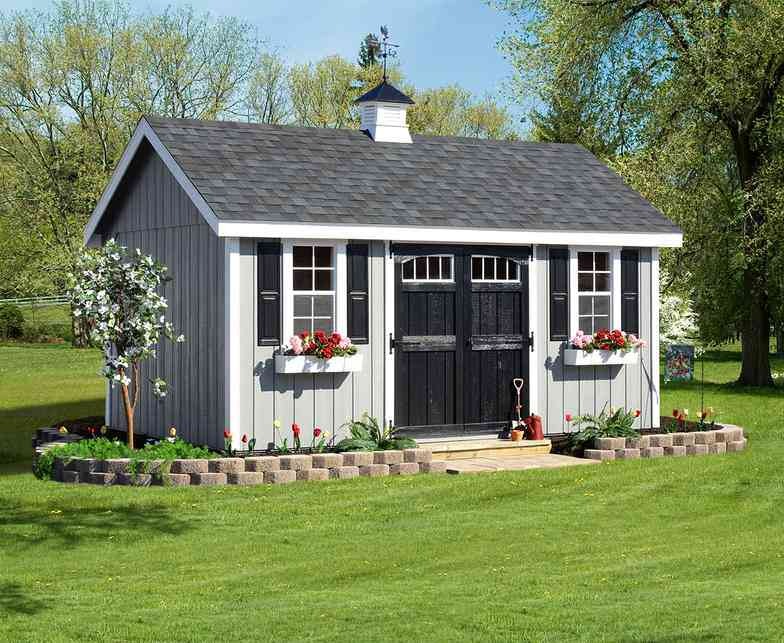 There are two large side doors for storage. Great dining room server. Special order in different stain color and hardware. Mission chairside table and Mission coffee table. Shown here in two-tone black and harvest stain color. Also available in new painted colors. Amish made single pedestal dining table. Shown in golden oak. Other stain colors and woods available. Mission chest of drawers. Shown in golden oak. With full extension gliders and dovetailed drawers. 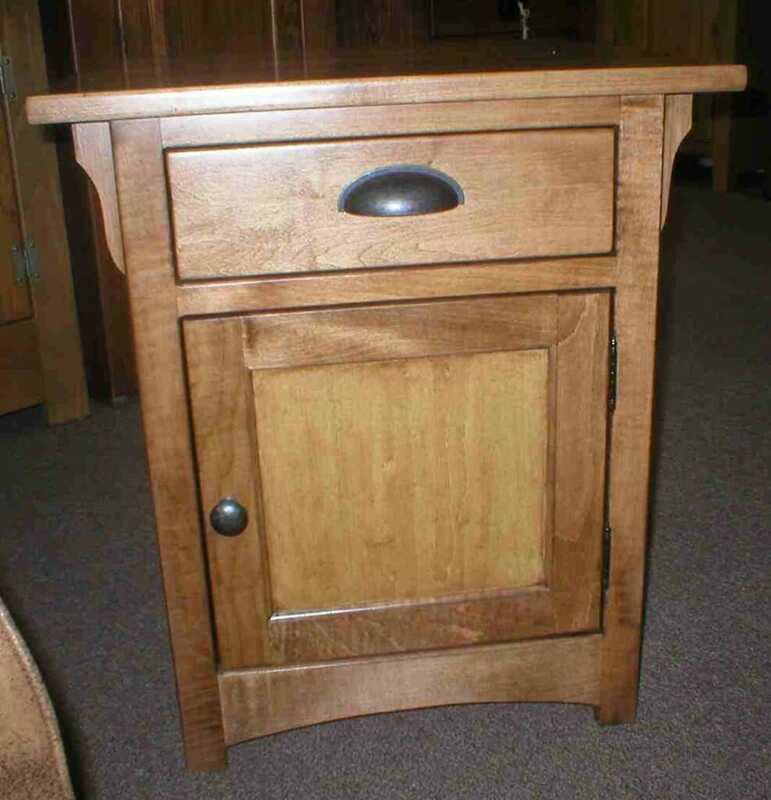 Mission night stand Amish made furniture. 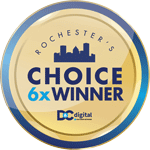 Chooses of hardware,wood and finishes. See store for details. Amish made mission bed. Shown in solid golden oak. Can be special ordered in other finishes. Available in twin,full,queen,and king. Other options are low profile foot board. Mission three drawers media cabinet. Solid oak with mission door pulls. Two adjustable center shelves and two adjustable shelves on each side. Mission T.V cabinet adjustable shelf behind doors. 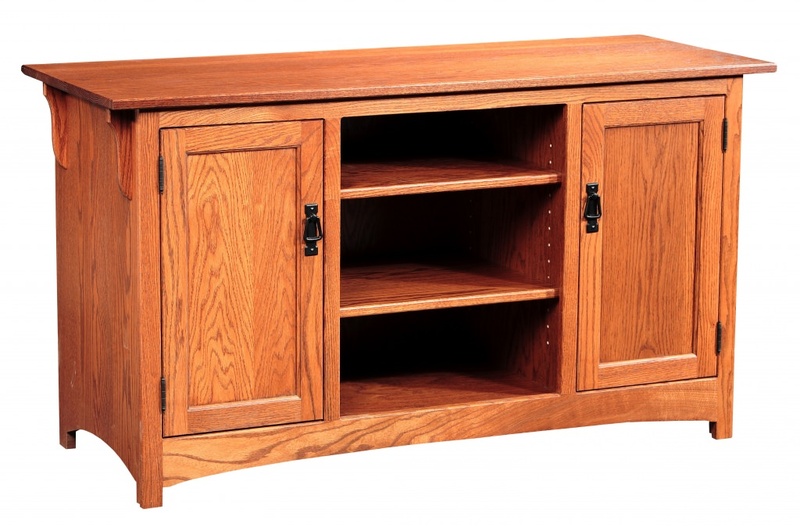 Mission Entertainment comes with adjustable shelves. Mission door pulls and wheels for easy moving. 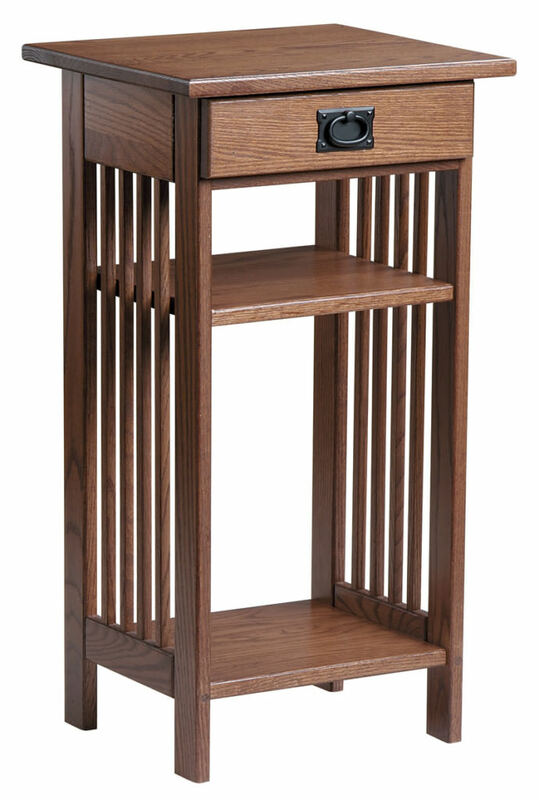 Mission phone stand in solid oak comes with one drawer that has full extensions glides. Mission wall mirror with convenient black hooks. Solid oak wood. 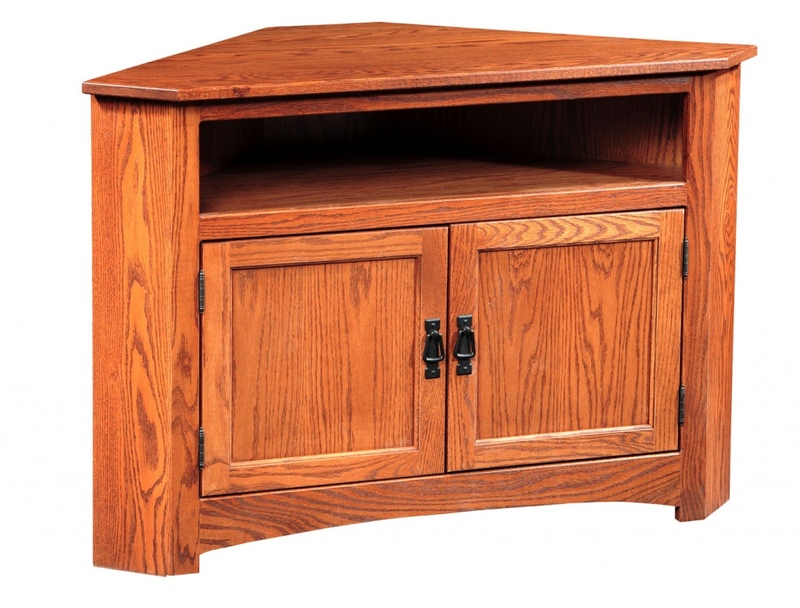 Mission solid oak TV table has a top and bottom shelf for TV components and bottom drawers for extra storage. 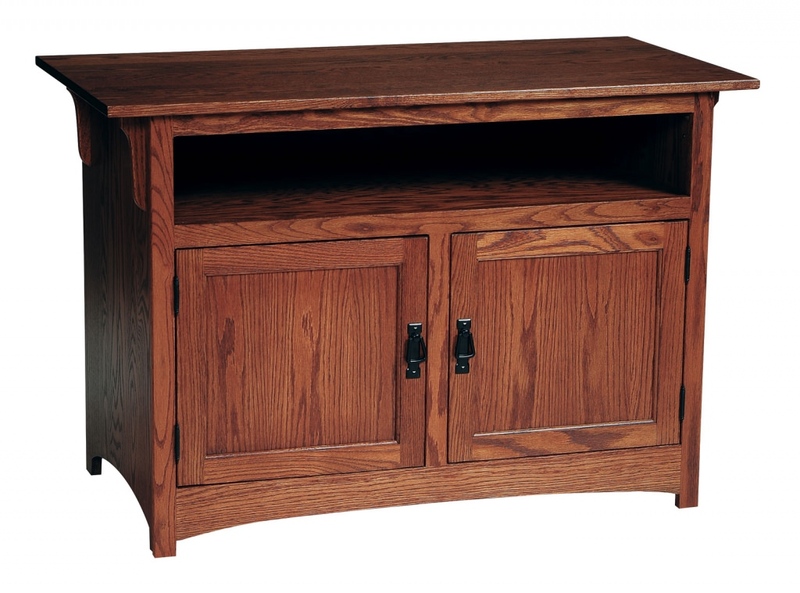 Mission 2-door sofa table in oak wood. This table has full extension glides on drawers. Drawer fronts have black mission hardware. Mission one drawer console table with full extension glides. Mission hardware on drawer. Solid oak wood.